Just a brief thought. Today in Japan round eyes are considered cute. That's an expression one hears all the time and it is also evident from anime and manga, where likable characters have round eyes and the baddies have narrow eyes. But when did this positive view of round eyes start? 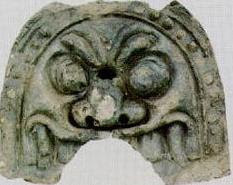 If we look at premodern Japan, we find round eyes in depictions of devils (oni), goblins (tengu), Deva kings (niô), hannya-demons, animals such as tigers and lions, and warriors in battle. Round eyes seem to have been regarded as something terrifying and perhaps related to the supernatural. These round eyes do not seem to be just a sign of agitation. 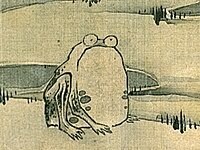 Supernatural beings (yôkai) usually have the same round eyes even when they are relaxed and at ease. 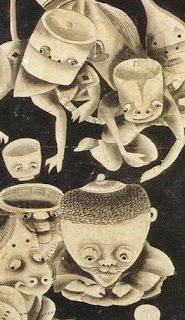 To the right is Itô Jakuchû's famous Tsukumogami-zu (painting of spirits inhabiting things one has used for a long time) from the 18th century. 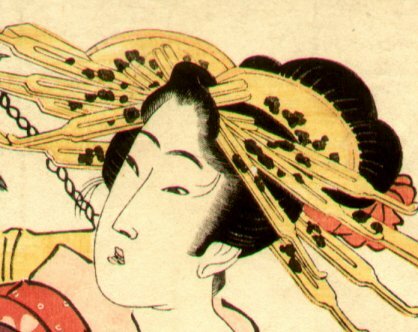 By contrast, everyone who's ever seen a nô-mask or ukiyoe-print knows that ordinary people were usually depicted with narrow eyes. 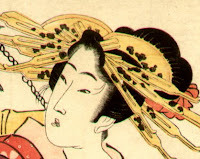 Benevolent deities (think of Ebisu or Daikoku) or buddhas also usually have narrow eyes. When did things change? 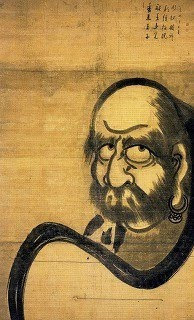 First lets consider what may look as an anomaly: depictions of Bodhidharma (Daruma-san). 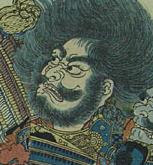 As far as I know, Bodhidharma has always been depicted with big round eyes in Japan. Many who are familiar with the popular Daruma-san dolls would object to what I've just written by pointing out that these dolls are often very cute. But when did they become cute? Might it not be a very late phenomenon? 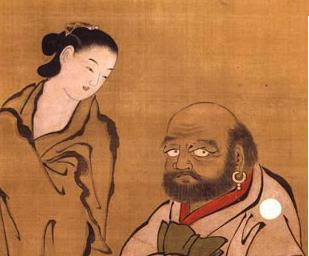 Let us have a look at some earlier depictions of Bodhidharma. The portraits seem very different. Only in the later one is there anything resembling what we today would call cuteness (a subjective judgment of course). Wouldn't it be possible to say that originally, the round eyes of Bodhidharma signified not cuteness at all but rather a closeness to terrifying supernatural forces, similar to what we find in depictions of dragons and so on? That would fit the well-known gruesome anecdotes about him - tearing away his eyelids to stay awake during meditation, meditating until his legs fell off, and so on. Itô Jakuchû (1716-1800) is to me a painter who has played an enormous role in the development of "cuteness" in art. Sharon Kinsella and others usually date the start of "cute" to the late 60's or 70's, but as Itô's paintings how this sensitivity goes back much further in time. Take this frog for instance! If we look at one of his contemporaries, Takeda Shunshin (Baiôken Eishun), we find a painting of Bodhidharma together with a prostitute. The round eyes are cute rather than fearsome or uncanny. If anything, it is the prostitute, smiling and towering over him, who looks superior. Recall that cuteness is a sign of the lack of power, of defence. Is this where we see the beginning of Bodhidharma's transformation into a cute mascot? 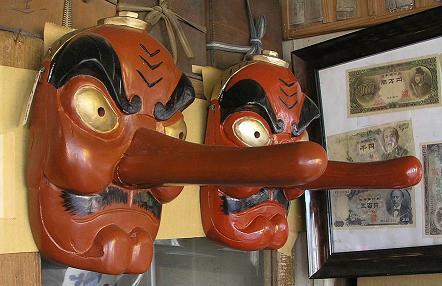 Whether by coincidence or not, the popularity of the Daruma-san dolls also dates from this period (the latter half of the 18th century). So, something happens in the Edo period. Perhaps this is when round eyes start to appear cute? 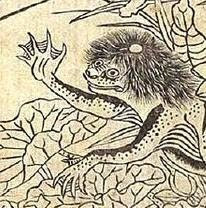 This is corroborated by the example of the tanuki (raccoon dog), a classical trickster and evil-doer in Japanese folktales. The tanuki too is usually (but not always) depicted with big round eyes. Most people who've been in Japan are familiar with this comical-looking figure with the big belly who greets visitors at the entrance of restaurants or private homes. 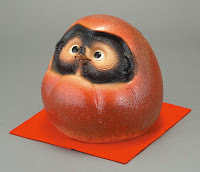 This "cute" tanuki, however, seems to have been an invention of the Edo period. 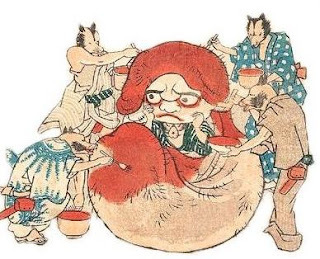 In folk tales from the middle ages, like Kachikachi-yama, the tanuki is depicted as gruesome and man-eating. Just like "Daruma-san", then, the tanuki developed from a feared into a cute character, and it seems to have happened during the Edo period. Incidentally, people of the Edo-period felt that there was a similarity between Daruma-san and the tanuki. There's a woodblock print by Kuniyoshi (1797-1861) showing a tanuki being dressed up as a Daruma-san by a gang of other tanuki. This motive also seems popular today (as in the ceramic figure above). The kappa is a similar case. This originally Chinese river deity (hébó, pronounced kahaku in Japanese) was imported to Japan in the 6th or 7th century. At that time it was fearsome enough to be thought to demand court sacrifices. Today, however, it is pictured as a rather cute, green and childlike being with turtleshell, a bowl on its head, and round eyes. When did the change take place? The Edo-period. But why did round eyes become regarded as cute? That's anybody's guess, but the process is probably related to the domestication of nature. 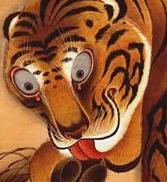 Remember that big round eyes were once associated with animals, with the "wild", with terrifying inhuman powers. 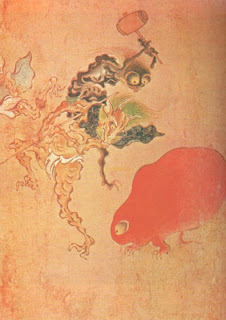 As mountains and forests became viewed less and less as a threat during the Edo period, its inhabitants too - like the tanuki, but also hermits and "mountain priests" (yamabushi) - started to be regarded as harmless or inferior to the inhabitants of settled society, as cute and defenseless rather than fearsome. That would explain the "cutification" of tanuki as well as of Daruma-san. Probably, it's no coincidence that it's in the Edo period that we see the appearance of "cute" Zen monks like Ryôkan, famous for having loved to play games with children. So in that sense, the "cute" eyes of manga characters today reflect the domesticated forces of the wild! 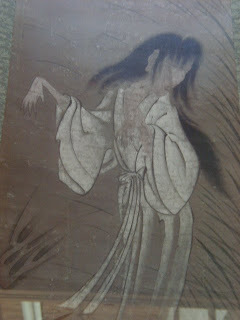 Addendum 1: How about ghosts? So how should we account for the narrow eyes of ghosts? Look at this post (and the follow-up here) for a discussion of how to solve this riddle! Addendum 2: The word "maru"
Speaking about the cutification of round things, let me mention one more instance - the word "maru" (round). It's well known that many ships in Japan have names that end with "maru". The first example of this in the sources is from 1187, so the explanation that this has to do with the Portuguese mare (sea) falls. "Maru" was also a common postfix in children's names. Research based on Edo-period sources has shown that "maru" was also used in the names os swords, helmets, armours and musical instruments. Amino Yoshihiko rejects the interpretation that such things were favorite or beloved objects. Instead he argues that "maru" was used for things not quite belonging to the human world or that were thought to possess magical or supernatural powers. In medieval times it was used in the names of hômen, former convicts employed as executioners who were regarded as outcasts and who probably wore a hairstyle similar to that of children (kiyome-maru was a name used for them as a group). Children were considered close to the sacred, as seen in the proverb that children belonged to the world of the gods until the age of seven, and were believed to possess superhuman abilities that helped them control animals (Incidentally, I wonder if this might not be the reason why some of them used "hôshi", Buddhist priest, as a postfix in their names, like Oda Nobunaga whose child-name was Kichibôshi). Musical instruments were used to call forth gods and hence were considered sacred or magical. Ships, swords - here I recall the "Onimaru" in Taiheiki or the "Azamaru" mentioned in Shinchô kôki - and other pieces of warrior equipment were things to which one entrusted one's life or that were used in extreme or liminal situations. Although "maru" may have come to indicate cuteness in the Edo period, originally it would have evoked feelings of dread or awe (Amino, Chûsei no yûjo to hinin, Tokyo: Kôdansha 2005:97-102). By the way, does anyone recall the robber Tajômaru in Yabu no naka? This explains why this decidedly un-childish figure has a child-name. Amino Yoshihiko (9): "Igyô no ôken"
Amino Yoshihiko (5): "Môko shûrai"
Amino Yoshihiko (3): "Akutô to kaizoku"